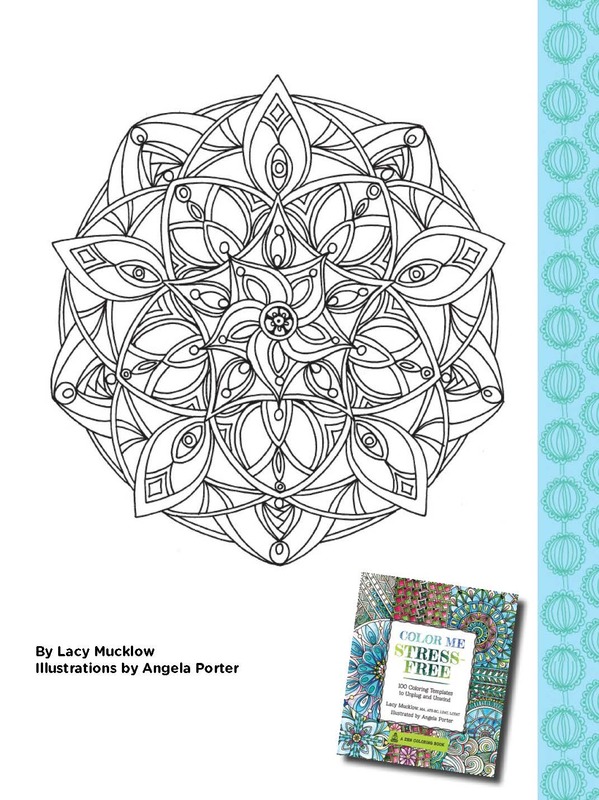 Lacy Mucklow is a different kind of adult coloring book author. 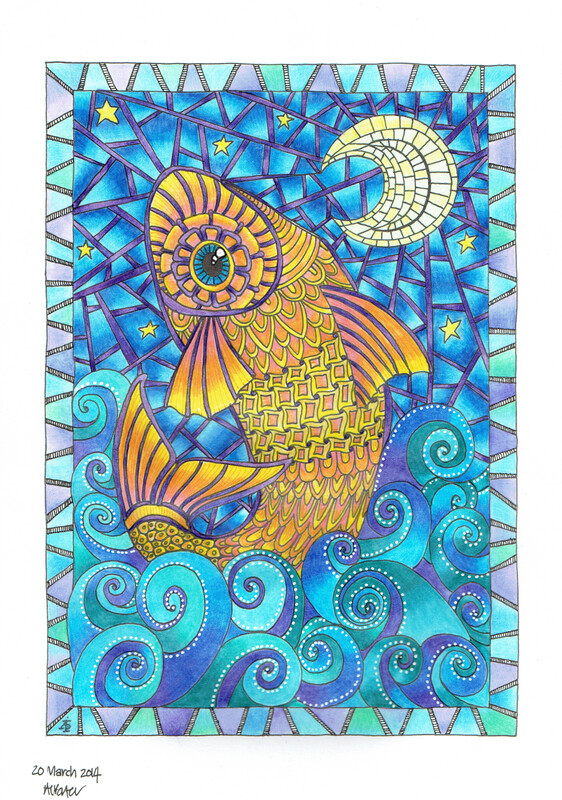 Unlike most authors in this genre, who mainly work as professional illustrators, Lacy is a registered, board certified, and licensed art therapist who has been practicing art therapy in the Washington, DC area since 1999. She holds the certifications of MA. ATR-BC, LPAT, LCPAT, and has experience working with a variety of mental health populations in schools, home-based counseling, and hospitals with adolescents, families, and adults. 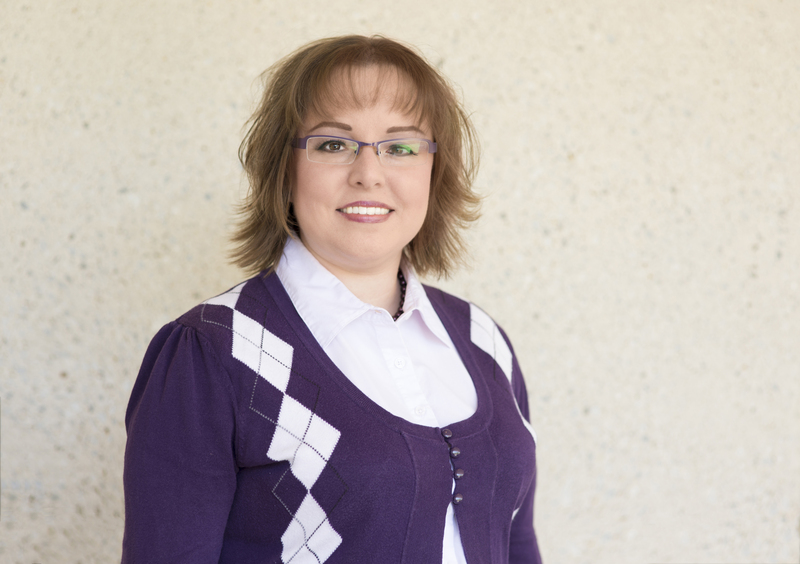 As a professional therapist Lacy holds a Bachelor of Arts degree in Psychology, but she has a serious art background as well, with a minor in Studio Art from Oklahoma State University, and a Master of Arts degree in Art Therapy from The George Washington University. Lacy approaches her adult coloring books from a therapeutic perspective first. After planning the psychological goals of each book, she works in tandem with illustrator Angela Porter to conceive the images for each page. 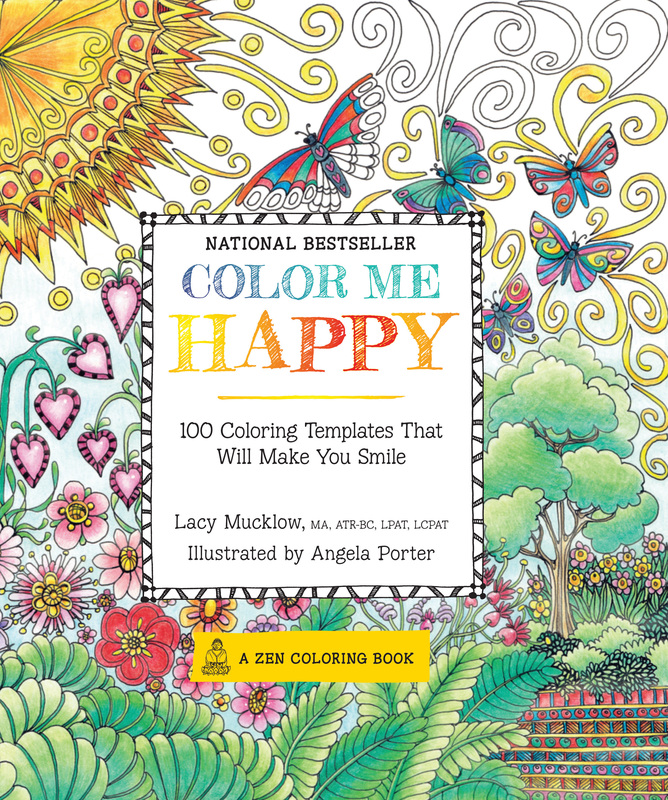 Together, the pair form a power team who have created the best-selling “Color Me” series of books, including Color Me Calm, Color Me Happy, Color me Stress-Free, and Color Me To Sleep. Interested in checking out their work? 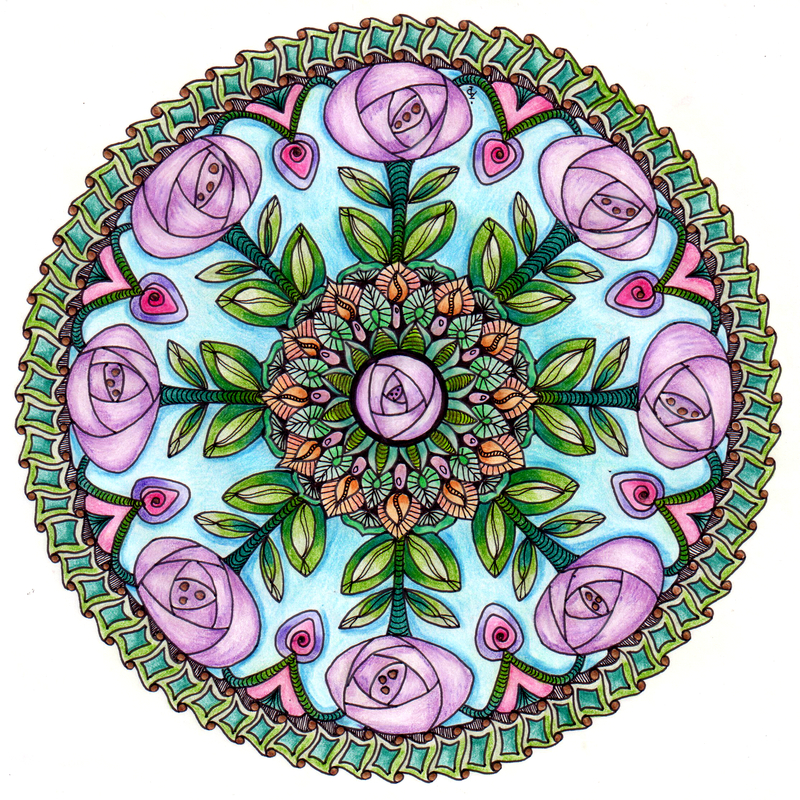 Download two free Lacy Mucklow coloring pages here and here! 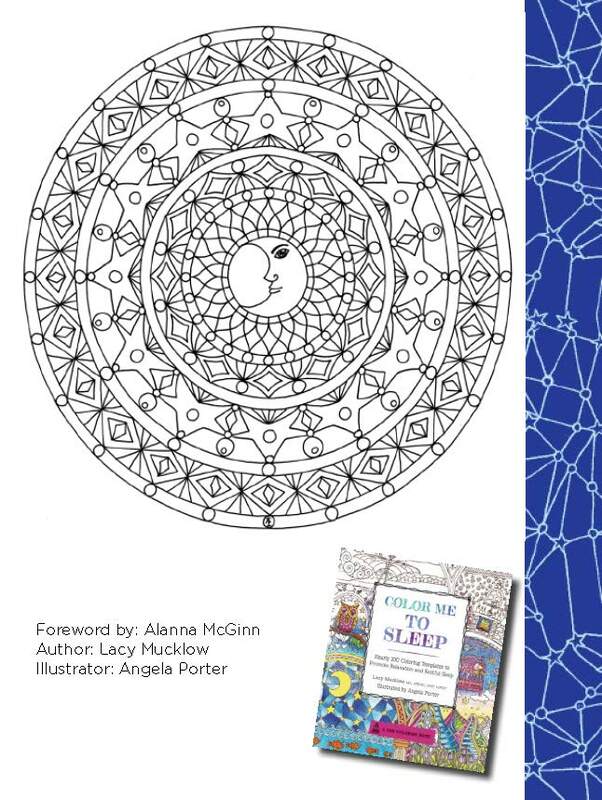 Read on to learn more about Lacy’s therapy background and how she creates adult coloring books that are both therapeutic and beautiful. Q: Please tell us a bit about your background as an artist. A: I am an art therapist, so I have training in art, but I use it to help facilitate psychological treatment for clients to have another way to express themselves or to safely explore what is going on internally for them. I took art classes all the way through high school as well as community courses (charcoal portraiture, chalk pastel animal portraiture, figure and portrait sculpture), and I have a minor in studio art (I studied art history, drawing, watercolor, oil painting, sculpture, and design) with a major in psychology. I have a master’s in art therapy, which taught me how to use my knowledge of art in a therapeutic way with clients. 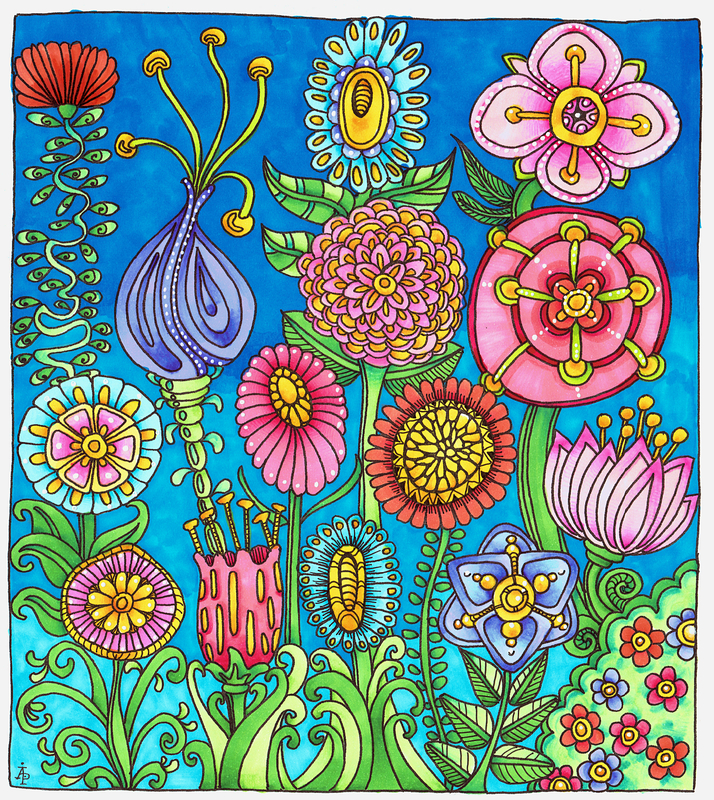 Q:When and how did you get into creating adult coloring books? A: That’s a good question, because I’ve only really focused on being involved with the adult coloring book phenomenon since being asked to write the “Color Me” Series in 2013. To be honest, this actually came about because of an art therapy blog I started and have kept going since 2005 to highlight the field of art therapy and create a resource for people interested in art therapy. (http://arttherapist.blogspot.com/) Through this blog, the editor at Race Point Publishing contacted me because of my art therapy credentials and interest in using art as a meditative and calming intervention, among other benefits. So the offer of being involved in authoring a potential series was intriguing to me and I wanted to be engaged with a new experience with a focus to help people in the process. Q: What are some of your favorite pencils, pens, markers or other tools for coloring? A: Some colored pencils that I like to work with back from my high school and college days are the Prismacolor pencils as well as their markers because of their rich color. I also enjoy working with metallic colored pencils (I’ve tried various brands) for some nice accents. Using permanent markers such as Sharpies, are also fun sometimes to use for bold color, especially using the fineline versions. Also using metallic or glitter gel pens can also be interesting to color with for some extra embellishment. Q: Can you share any special techniques you use to get great results in your coloring? A: Generally, when I use pencils, I try to use various gradations to give it a more interesting look, which I can do with heavy or light pressure. Sometimes I will blend colors together for a slightly different hue, or to blend light and dark colors of the same family together. I also tried a technique for blending other than using a blending pencil or stump, which is using petroleum jelly on the tip of a pencil to blend the colors more smoothly, and it can also give the colored pencils a smoother and less grainy look. Especially with abstract designs, I often pair complementary colors together, and I usually alternate warm and cool colors together so that each pattern or area is distinct. Q: What is your process like when you create a coloring book? A: Since I write the books rather than illustrating them, I can tell you how the process works for me. I think the “Color Me…” series is different than most, if not all, coloring books out there because we have particular themes to each book, with chapters that break each book’s theme down into components related to the overall topic of each book. So when we decide what the next title will be, I first start thinking about how I’m going to break down that topic into 6 or 7 relevant chapters that reflect the most universal components or associations with them. As an art therapist, I gather this information based on what I may have seen most often with clients or other people that seem to be universal, as well as draw from the research or well-known associations and archetypes through time and culture. 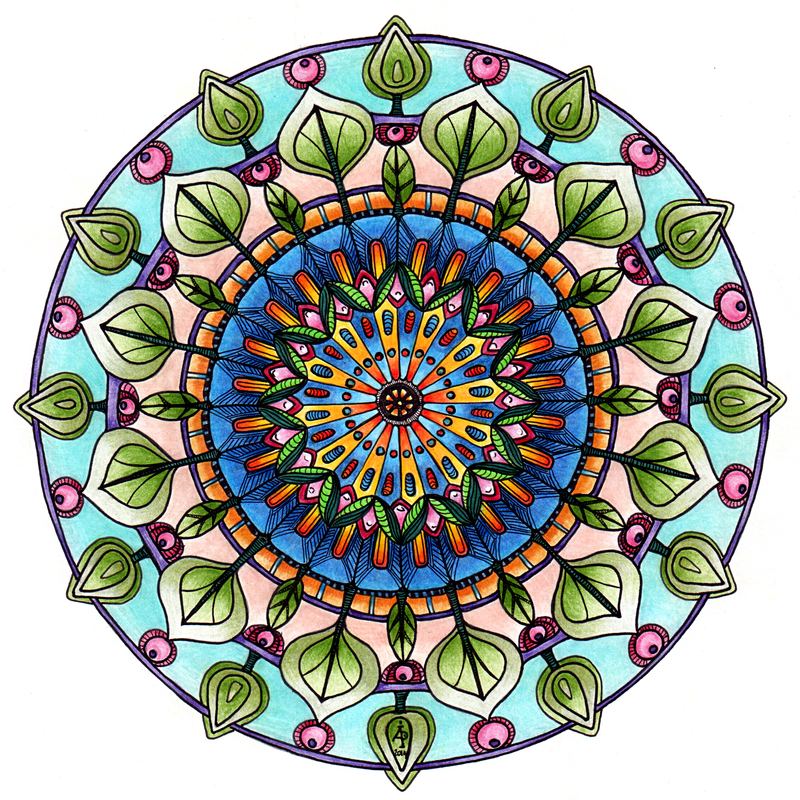 For instance, mandalas have been the most-researched intervention that show a reduction in anxiety or stress when used as an approach – both in coloring in pre-designed mandalas as well as drawing one’s own original artwork – so that was something I made sure we included as a whole chapter devoted to mandalas in “Color Me Calm,” and we also try to incorporate at least one mandala for each chapter in all of the books for that reason. For each book I formulate each chapter to help people focus on things that the book aims to encourage, whether it is calming down, relieving stress, boosting mood, helping to sleep, or becoming more confident. After I have those chapters narrowed down, I look for pictures that exemplify the artwork that I want Angela to translate into the black and white line drawing templates for people to color. I focus on images that may be symbolic, I might use archetypical representations of such a concept, I might focus on a particular stage of the Great Round of Mandala that might fit a stage of life development pertaining to that chapter, or I might select scenes that often induce that state of mind when people think about them. After I select those for Angela to work on the art, I write the text for each chapter for people to know why each chapter topic was selected, what they can expect from the chapter, and how the following images can help them focus on the main objective of the book. I also explain that there is a blank page that we leave at the end of each chapter so that if the colorer wants to draw their own template to color that is more personal to them, they can do so. Lastly, and perhaps ironically, I write the introduction to the book, talking about the benefits of coloring, the objectives and content of the book as a whole, and that coloring is for fun regardless of age and there is no judgment attached to it. I also include a coloring tips section for people to have available so they can have a better understanding of the energy of color, so they might have a more informed approach of how they might want to apply their color. Q: What’s the most challenging part of the process? The most rewarding? A: I think the most challenging part of the process in writing the coloring books is either deciding and narrowing down the chapter topics or finding just the right images that I want included for each chapter. The most rewarding part for me, other than the accomplishment of finishing each book, is all the wonderful and amazing feedback I get from people who take the time to write me and let me know what coloring in a specific book has done for them in their lives, either in particular circumstances, or just in their life as a whole. That’s definitely what this is about for all of us involved is to know that we have helped people because of these books. Q: Why do you think adults love to color? A: Coloring books for adults have been around for years on a small scale, but I think the coloring books started becoming really popular a couple of years ago. Apparently, the trend really started to swell in France, and then started spreading around the global market. My theory is that adults have always loved to color, but the adult coloring books are trending now because we are currently a society that is so digitally-minded that people are needing time to unplug more than ever. Going back to paper and pencil gives people a break from the inundation so they aren’t looking at another lighted screen in a world that is now so technologically-based. On top of that, it gives each person the freedom to be creative and develop that side of themselves, as well as provides a visual, mental, and emotional escape from the stresses of everyday life. We see the joy and excitement that children have when they color a book with cartoon characters that they love to see, and we tend to get away from doing things like that when we are adults, due to added responsibilities, a tight schedule, or even thinking that coloring is only for kids. That could actually be the furthest from the truth and we need to schedule self-care or “me” time to unwind. For example, in October 2014, a university in Missouri hosted a 3-hour campus activities event held at their Commons building for “Stress Relief Coloring” for students to come to as a mid-semester break. I think a lot of adults have always loved to color, but now they have “permission” to do so in a publicly accepted way. I also surmise that adults are interested in the books because it is an effective and innovative way to bond with each other. People have told me that they have connected with others by friends’ coordinating coloring parties, by parents’ coloring in the adult coloring books with their children as they color in their cartoon books, or by adult children coloring in the books together with their older parent(s). Communities, coffee shops, libraries, and bookstores are now also holding community coloring groups. They have all related that they enjoy that down time together doing the same thing with each other, allowing them to connect over the experience. All this with the fact that it a cost-effective method with a high rate of artistic success and positive side-effects make for a great recipe to be a big trend. Q: What’s your favorite creative activity to relax and unwind? A: That’s hard to say! 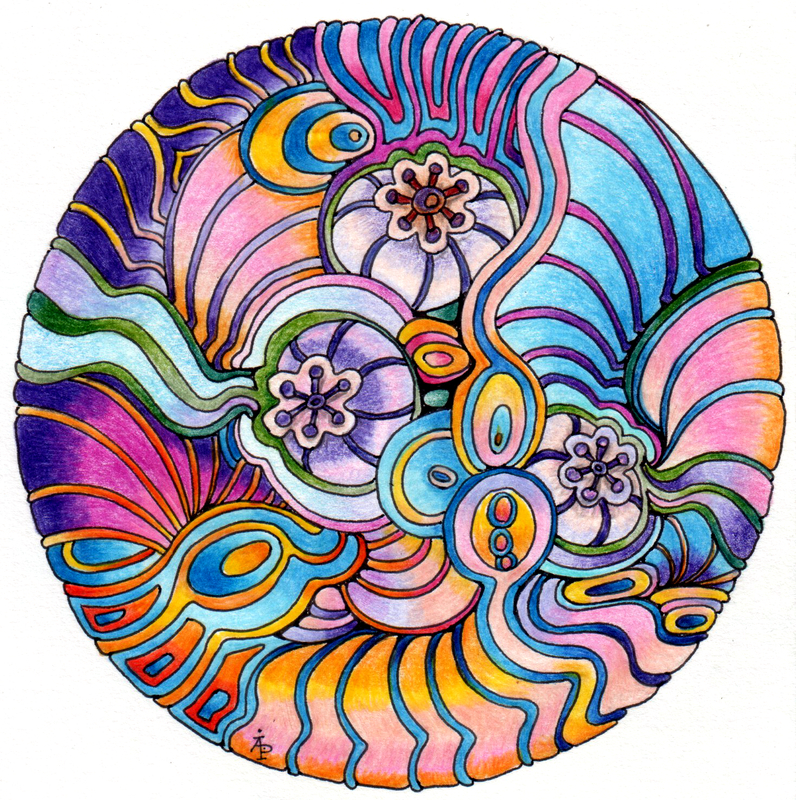 If it’s not doing art of some sort – I like Zentangling and drawing mandalas – it’s usually something associated with music or writing. I find listening to music relaxing, but sometimes playing music I enjoy can also be relaxing as well, since I play several instruments. Recently, besides writing books, I was invited to write lyrics, which I found to be strangely relaxing and exciting to do at the same time as a new creative outlet. 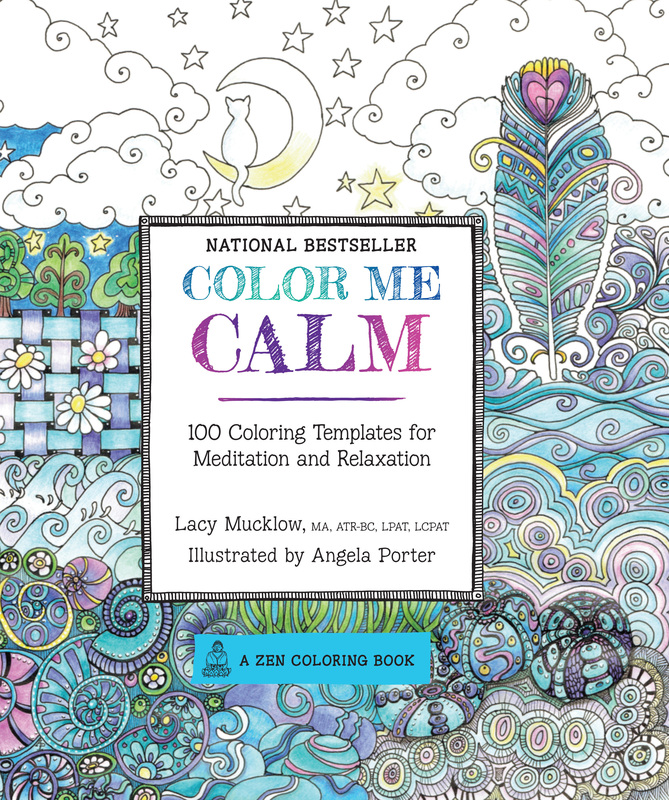 Ready to color yourself calm and stress-free? 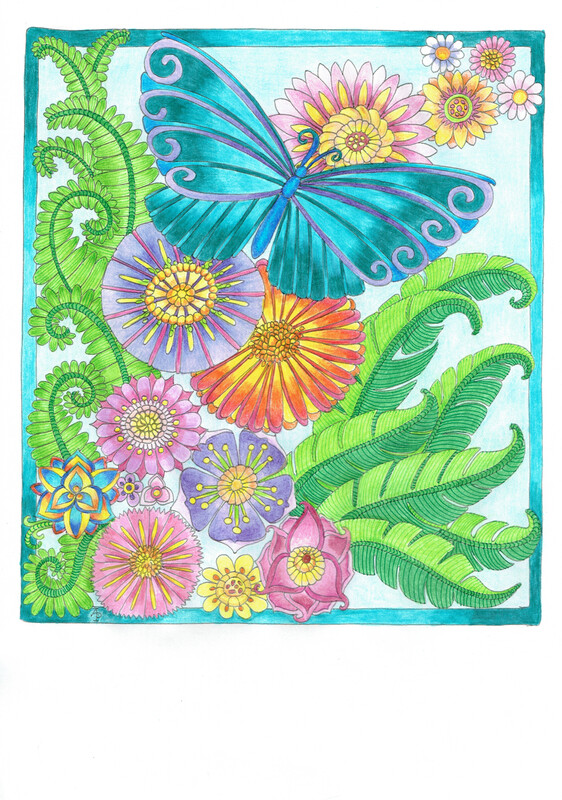 Download two free Lacy Mucklow coloring pages here and here! And for coloring tips and techniques from JOANN click here!